Mixing and dispensing rooms are designed specifically to keep people and facilities safe while maintaining proper storage temperatures. 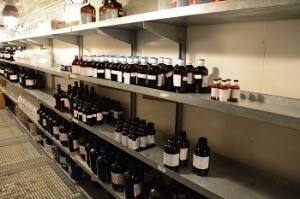 The article below illustrates safe storage techniques while providing helpful tips on organizing chemical inventory. 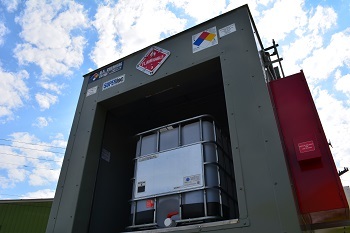 Storing raw chemicals inside a hazmat storage building will not only increase safety measures, but can increase production and help organize inventory when dealing with large volumes of chemicals. Shelving and racking systems allow inventory to be strategically organized and can eliminate stockpiling inventory. Hazmat storage buildings provide a dry storage atmosphere to maintain inventory in its original state. These buildings are engineered for extreme weather conditions while providing a long lasting shelter for keeping dangerous chemicals safe and secure. Hazmat storage buildings allow inventory to be maintained in any type of climate, while maintaining a safe internal environment. Chemicals should be kept in climate controlled storage buildings equipped with fire suppression systems when mixing and dispensing hazardous materials. Inventory must be stored in approved containers, general container sizes are five gallons or less. Chemical storage buildings should be equipped with proper mechanical ventilation to provide consistent airflow throughout each room, if more than one storage room is being utilized. Shelving and racking systems allow easy, organized storage solutions for compliant chemical storage. Do not store incompatible paint materials inside the same room. Utilize solid fire-rated or non-fire rated partition walls to separate incompatible substances, to create a safe storage atmosphere. To learn more about safe chemical storage buildings and mixing and dispensing rooms contact us online or call (800) 233-1480 for a free chemical storage consultation from one of our chemical storage experts. Clean Link Professional Chemical Cleaning Indstury. Six Tips on the Safe Handling of Cleaning Chemicals. May 1st, 2013.